Albert Tanjaya encouraged the discussion of Asian stereotypes Wednesday night, evoking a feeling of acceptance from the group gathered in room G8 of the Cathedral. “We are talking about the journey of self-identity, self-discovery and what it means to be an Asian-American,” Tanjaya said. 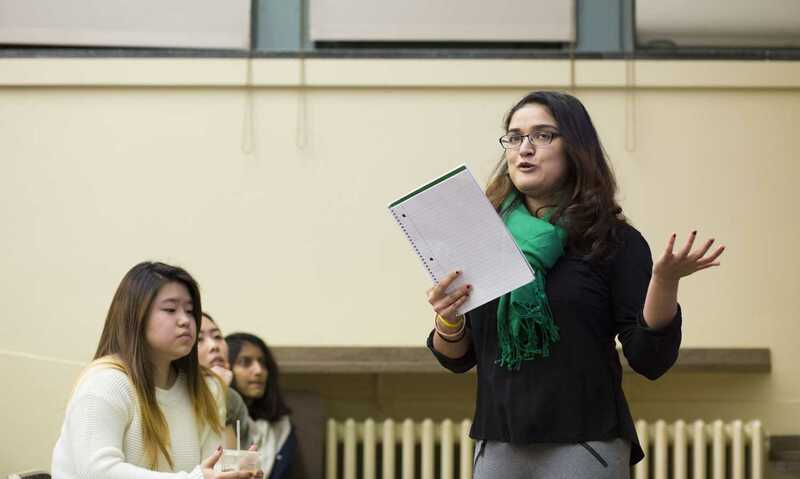 Tanjaya led 30 members of Pitt’s Asian Students Alliance on an interactive journey in an event titled “Above and Beyond the Bamboo Ceiling,” — ASA’s first advocacy workshop and general body meeting of the semester. The workshop brought together individuals from all groups under ASA — an umbrella organization comprised of the Chinese American Students Association, the Vietnamese Student Association, the Filipino Students Association and the Korean Student Association. Though they expressed different viewpoints, the event encouraged them to open their minds to a host of new questions surrounding the Asian-American identity. ASA is focusing this year on comparing past and present events to observe how treatment of minorities has advanced or failed to improve in social and political circumstances — in one instance comparing the Chinese Exclusion Act of 1882, which prohibited Chinese labor immigration into the U.S. for 10 years, to Trump’s recent executive order to ban travel from several Muslim-majority countries. Tanjaya, a sophomore computer science major and comparative politics minor, organized the event and led the workshop throughout the night. As advocacy chair of ASA, Tanjaya is responsible for creating content and planning events that expose Asian-American struggles and values in a changing time — citing intersectionality as one way to better understand these issues. Courtney Yu, a junior political science and economics major, was advocacy chair last year and hosted a similar workshop for ASA. Yu said she was proud to see the direction Tanjaya has taken in bringing new ideas to the position. Tanjaya divided the audience into five groups at the beginning of the event — asking the participants if they have a first-generation immigrant parent, their high school was diverse and they were raised in either the city, suburbs or a rural area. The questions were designed to encourage audience interaction among different people, according to Tanjaya. The groups then discussed their thoughts and concerns when it came to their personal family dynamics and how their past has shaped their future. Members shared personal information about their families, discovering a common struggle in finding their place in new surroundings while staying in touch with their cultural heritage. Tanjaya then reintroduced the title of their workshop — “The Bamboo Ceiling” — by asking the groups to discuss what they thought the term meant. Many audience members drew comparisons to the “glass ceiling” — an intangible yet widely acknowledged barrier women face in the workplace — and said the word “bamboo” was mainly derived from preexisting Asian stereotypes, a suspicion Tanjaya reinforced. As the workshop began winding down, Tanjaya left the groups with thought-provoking questions about the factors that shaped them, their values and how much they know about their family. “Have you ever felt alone or different because you’re Asian?” he asked. Audience members’ answers varied given where they were from, but all groups voiced similar sentiments that having organizations like ASA helps void the feeling of being alone. One member in attendance, Diya Goyal, a first-year psychology major on a pre-med track, said as a person of South Indian and Asian descent — which does not fall into the category of a typical Southeast Asian — it was nice experiencing and relating to other Asian cultures. “You don’t see people like me in the Asian Students Alliance, but everyone did make me feel welcome,” Goyal said. Goyal said after leaving the workshop, she hopes that a more diverse group of ethnicities will come together to experience Asian culture and educate themselves. “Don’t feel like you don’t belong, because we accept everybody,” Goyal said.